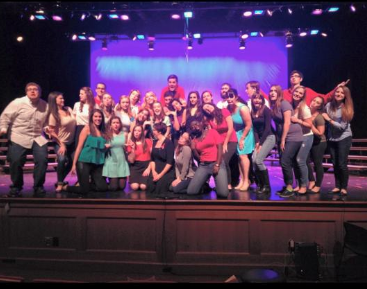 Marist Singers Hold Annual Benefit Concert for Broadway Cares. Students, families and friends all came to the Nelly Goletti theater this past weekend the Marist College Singers held their annual benefit concert, A Night on Broadway. All proceeds from the concert go to Broadway Cares/Equality Fights AIDS. The singers performed the show three times in one weekend after rehearsing for about six weeks. Broadway Cares/Equality Fights Aids is a non-profit organization that raises money and awareness to fight AIDS. Since 1988 they have raised more than $225 million thanks to the generosity and resources of the American theater community and school groups like Marist’s Singers. For the past 10 years the Marist College Singers have been putting on this show to help raise money for this organization. The show is different from the other various singers concerts performed throughout the year. The singers break into small groups or solos to do different Broadway numbers. There were large group numbers as well as dance and some light acting. “Last year we raised $7,000 for Broadway Cares, this year our goal is to raise $9,000,” announced Kenny Lane, singers president, before intermission. To help reach their goal they got donations from local restaurants, Broadway merchandise and even a trip to Puerto Rico to raffle off. Raffles were announced before the final number was performed. They were a huge success and helped raise over $7,000 for the cause, bringing them closer to their goal. Over the past four years Night on Broadway has raised a total of over $20,000 to help fight AIDS. There are about 200 students involved in the Marist Singers. Marist does not offer a music major so none of the students involved are even studying music. They all show up several times a week because they love singing and want to be there. Sarah Williams, Director of Choral Activities, gave a small speech at the end of the show to thank everyone involved for their help and dedication. “I have the best job in the world because when I show up to teach my students they actually want to be there,” said Williams. Students dedicate an immense amount of their time to singers and it does not go unnoticed when show time comes around. “We rehearse twice a week for about an hour, but we only got to perform the entire show on stage one time before we performed it,” said Maggie Gunther, Marist senior and vice president of Marist Singers. “We also had one night in the theatre to figure out the technical aspects of the show.” They began rehearsing for the large group numbers back in late September. In October auditions were held for smaller groups and solos, those who were chosen to perform then had roughly a month to rehearse and prepare their numbers for the show. The show was very well put together, alternating between solos and group performances. Groups or solos that preformed numbers from the same show were arranger around each other, making a smooth transition from song to song. The ending number was a medley of songs and scenes from the musical West Side Story. The number examplified just how talented the group is. They sang various songs and incorporated dance and dialogue from the play. It was a beautifully done number and really tied together the whole production. “Last year we raised $7,000 for Broadway Cares, this year our goal is to raise $9,000,” announced Kenny Lane, singers president, before intermission. To help reach their goal they got donations from local restaurants, Broadway merchandise and even a trip to Puerto Rico to raffle off.